As the calendar turns to June, we enter into the height of wedding season. The families of the soon to be bride and groom engage in a flurry of activity to ensure all the preparations are ready for the big day. 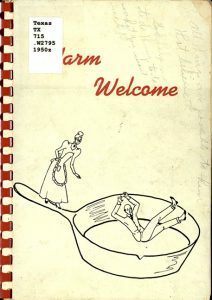 Some of the cookbooks housed at The Texas Collection include recipes and menus specifically designed with weddings in mind. 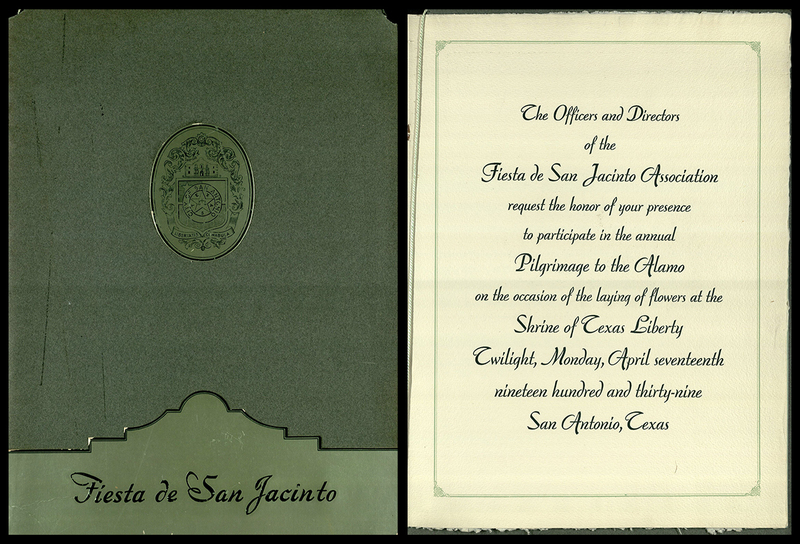 One of the most detailed descriptions of these preparations comes from a quirky cookbook published in the 1950s by the Charles W. Cook Auxiliary at Christ Episcopal Church in Laredo, Texas called Warm Welcome. 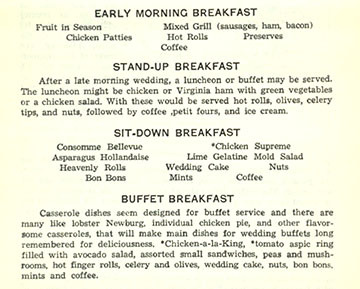 The rest of the section preceding the recipes explained the traditional food and beverages served at wedding receptions. No matter what time of day the reception was held, champagne remained the standard beverage served. Etiquette did allow for a fruit juice or gingerale punch as suitable substitutes, though. Every reception also featured a bride’s cake covered in beautiful white icing which could be topped with the same flowers used in the bridal bouquet. 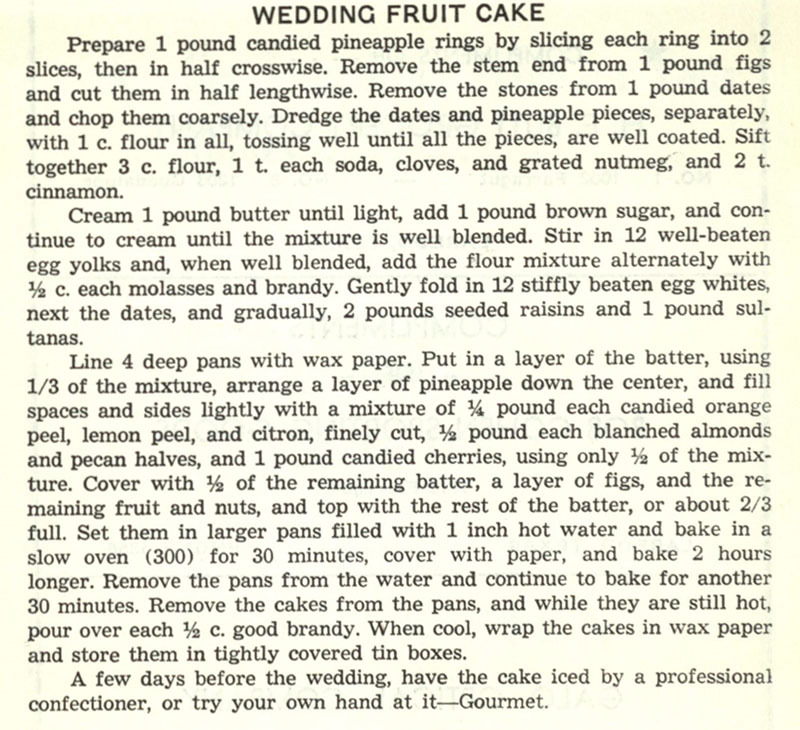 A recipe for the traditional wedding cake, a dark fruit cake. 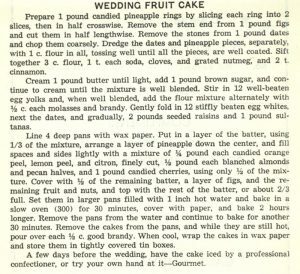 For weddings with larger budgets, the cookbook described another traditional element of the reception. Each guest received a piece of dark fruit cake in a small white box wrapped in a white satin ribbon. This cake was the designated wedding cake, as opposed to the white bride’s cake that we think of today. The mother of the bride saved a piece of the fruit cake for the bride and groom to eat on their first anniversary. Protocol allowed for the two cakes (bride’s cake and wedding cake) to be combined into a single cake with white cake making up the first two tiers and a layer of dark fruit cake at the top. Sample menus for receptions at various times of day and levels of formality. 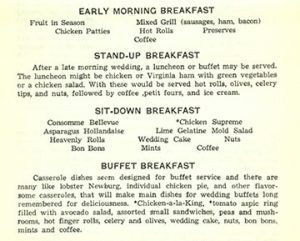 After the explanation of some of the etiquette and traditions surrounding wedding receptions, the cookbook provided specific menus for the various times of day a wedding reception might be held. With menus for early morning breakfast, stand-up breakfast, sit-down breakfast, buffet breakfast, breakfast served at high noon, luncheon, or supper, any bride and her family could plan the perfect reception. 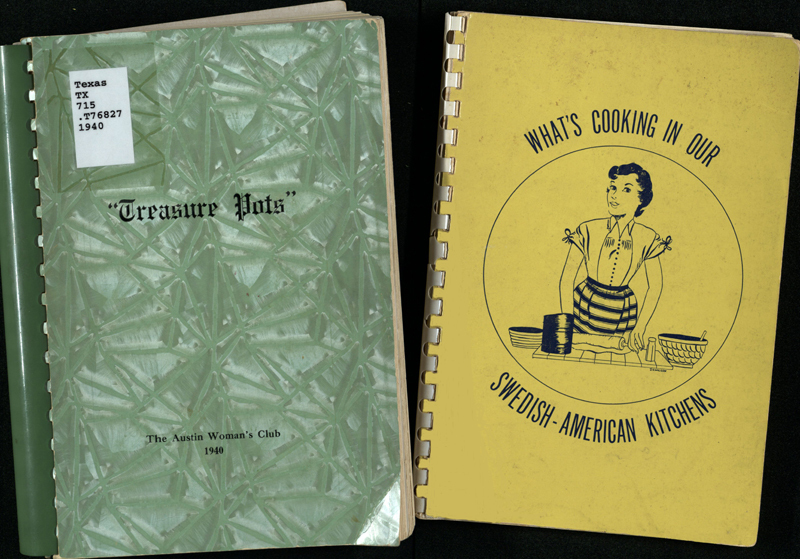 As you can see, cookbooks provided much more than simply recipes to the women who owned them, and helped them plan some of the most important events in the lives of their families. Charles W. Cook Auxiliary Christ Episcopal Church. Warm Welcome. Laredo, TX: 1950s? Are you hungry for dinner yet? Prepare to salivate, because we’ve got some delicious dishes to share with you! As we prepare for our Cooking in Texas event, we asked our panelists to share some of their favorite recipes with us, and boy, do they sound good! Today we’ll share a few entries, and we’ll post a couple more next week. 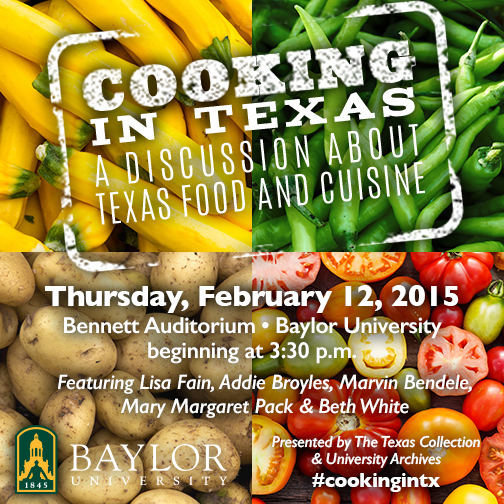 If these tickle your taste buds, please join us at Bennett Auditorium on Thursday, February 12, at 3:30, to talk Texas food and cuisine—and then head to the Texas Collection reading room for a reception featuring regional cuisine prepared by culinary students at Texas State Technical College, more foodie discussion, and cookbook signings. The event is free and open to the public. Lisa Fain is the James Beard Award-winning creator of the food blog Homesick Texan, and the author of The Homesick Texan Cookbook and The Homesick Texan’s Family Table. Her work has been featured in The New York Times, Texas Monthly, Southern Living, and Saveur, and she’s a founding member of Foodways Texas. 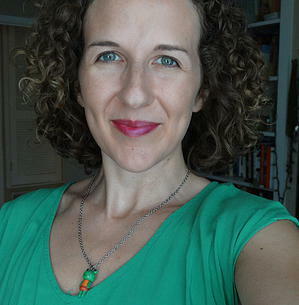 A seventh-generation Texan, Lisa currently resides in New York City. There are pies, and then there is my grandma’s chocolate pie. It’s a luscious chocolate custard resting on a flaky, almost salty crust, topped with a springy meringue. Whether times are good or times are bad, it’s always welcome and appropriate. It is my favorite dessert. Poke holes into the unbaked pie crust with a fork and bake it for 15 to 20 minutes or until it’s lightly browned. Some people prefer to weigh it down with pie weights or beans as it may bubble a bit. Remove from the heat and stir in the vanilla and butter. To make the meringue, beat the egg whites with salt until they are smooth, light and fluffy; they should have soft peaks like whipped cream. This can take anywhere from 5 to 10 minutes. (If you don’t have a stand mixer, a strong arm with a whisk or an eggbeater can accomplish this task, too. Please note that by hand it will take much longer than 10 minutes.) Stir the sugar into the meringue. Pour the chocolate custard into the baked pie shell and top with the beaten egg whites. Bake it until the peaks on the meringue are lightly browned, about 10 to 15 minutes. 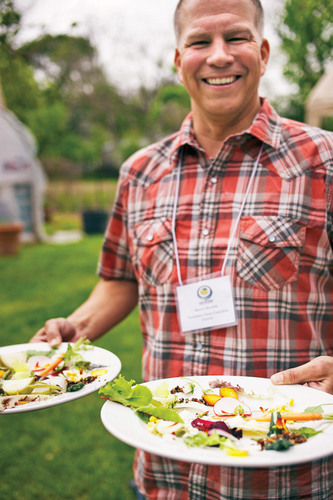 Marvin Bendele is the Executive Director of Foodways Texas. He is a Ph.D. Candidate in American Studies at the University of Texas at Austin, where he teaches a class on American Foodways. He contributed to the 2009 book Republic of Barbecue, and has completed multiple oral histories for the Southern Foodways Alliance’s Southern Barbecue Trail & the Foodways Texas oral history archive at the Briscoe Center for American History. 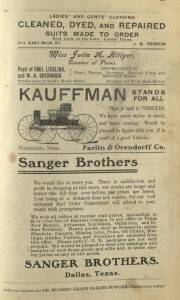 Bendele comes from an Alsatian-Texan family that settled in Castroville in 1848. Slice eggs, Scoop out egg yolks. Mash yolks with a fork and add remaining ingredients. Stir mixture together completely and put back into the egg whites. Garnish with paprika or small sprigs of parsley. Chill. Mary Margaret Pack is a fifth-generation Texan who grew up on the Gulf Coast eating shrimp, blue crabs, and rice and gravy. She’s a food writer/historian and private chef who divides her time between Austin and San Francisco. 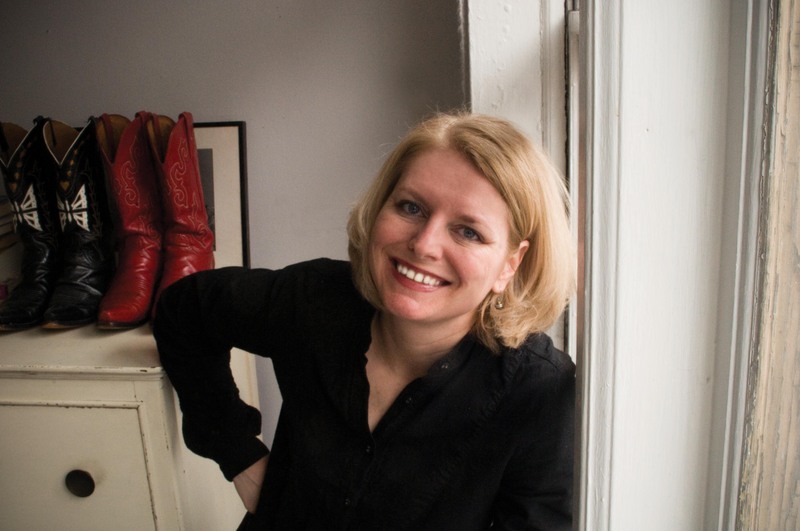 A former librarian and technical writer, she’s a graduate of Rice University, the University of Texas, and California Culinary Academy, and has been writing about food since 1998. A regular contributor to The Austin Chronicle and Edible Austin, she’s published in Gastronomica, The San Francisco Chronicle, Sugar & Rice, Oxford Encyclopedia of Food & Drink in America, Nation’s Restaurant News, Scribner’s Encyclopedia of Food and Culture, The Dictionary of Culinary Biography, and Southern Foodways Alliance’s Cornbread Nation 1. 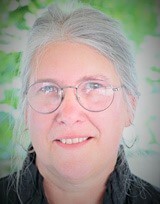 She’s presented on food and foodways to various museums and food history groups, as well as to IACP (International Association of Culinary Professionals), Les Dames d’Escoffier International, CIA-Napa, Southern Foodways Alliance, Foodways Texas, Texas Folklore Society, and the Historic New Orleans Collection. I grew up in Houston and, as I’m sure was the case for many little girls in the ’50s and ’60s, it was a huge treat to shop downtown with my mother at Sakowitz Department Store and have a grown-up, elegant lunch at the Sky Terrace. I often ordered the shrimp salad with avocado, and as I recall, so did my mother. This dish was served at least since the 1960s at the Sky Terrace Restaurant in the Sakowitz Brothers Department Store in downtown Houston, Texas (1950-1985). The popular Sky Terrace never published a cookbook, but this recipe was printed in the Houston Chronicle, and many versions are available online. It’s a great example of a mid-20th-century dish for ladies who lunched, yet it remains fresh, timely, and delicious. Lightly mix shrimp, celery, mayonnaise, lemon juice, and salt. Combine with remoulade sauce, cover, and chill. Halve avocados, remove seeds and peel and slice each half into four wedges. To serve, divide shredded lettuce among six plates. Fan four slices of avocado on each plate and top with generous portion of shrimp salad. In food processor, blend egg, shallots, garlic, spinach, mayonnaise, Worcestershire, mustard, lemon juice, anchovy paste, and pepper sauce. 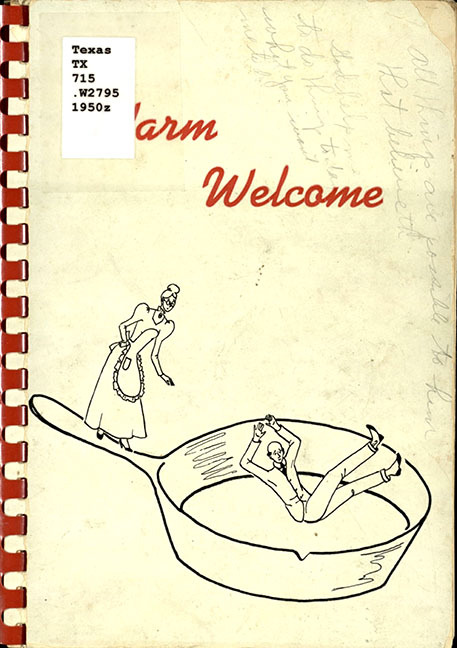 Elizabeth Borst White papers, 1905-1995, undated (#3910): Contains cookbooks produced by Texas utility companies as a service to their patrons, postcards of various places in Texas, and photographs of rice harvesting and processing machinery. White has also generously given The Texas Collection many historic cookbooks of Texas, which can be found in our online library catalog. 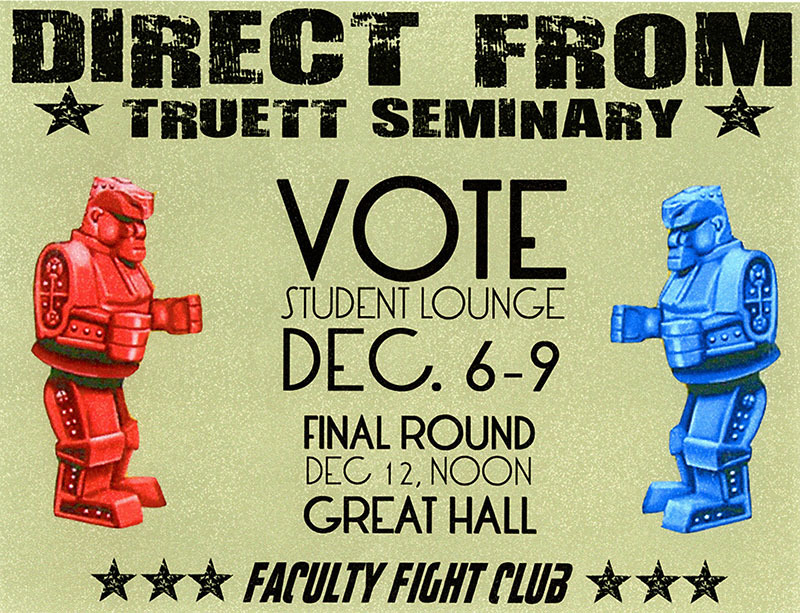 During finals, some Truett Seminary faculty participate in a Fight Club Wii boxing competition series–a chance for students to unwind by watching their professors compete! Students help campaign for and cheer on their professors with flyers like this one. BU records: George W. Truett Theological Seminary #BU/298, box 38, folder 10. BU records: George W. Truett Theological Seminary (#BU/298): Materials about Truett Seminary history, faculty and student life, and academic achievements, including when the seminary was first housed in First Baptist Church, Waco. 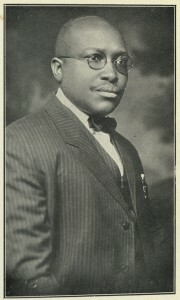 Lou Ann Sigler East Waco Community Photograph collection, 1925-1961, undated (#3916): Contains photographs of African American life in Waco, including Paul Quinn College and A.J. Moore High School students. Most of the people in the record group are unidentified. 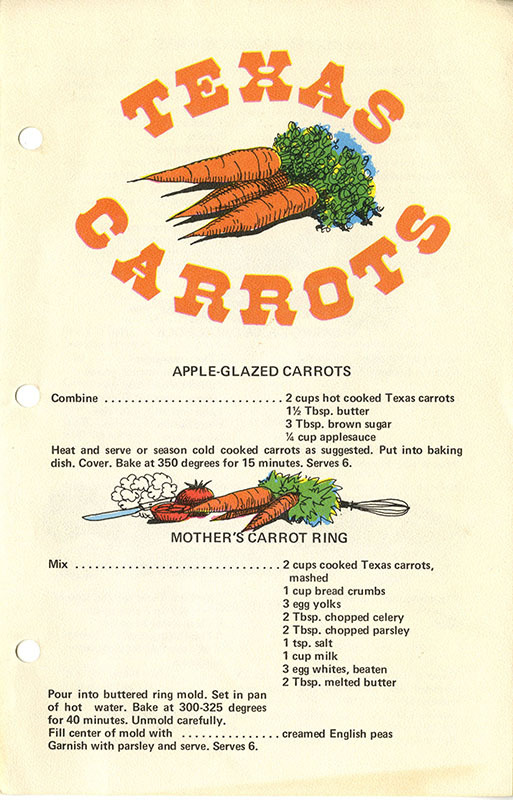 In the mid-twentieth century, the Texas Department of Agriculture began distributing cookbooks to the public in order to support Texas grown products, such as beef and carrots. Elizabeth Borst White papers #3910, Box 7, Folder 3, The Texas Collection, Baylor University. Elizabeth Borst White knows cookbooks! Twenty-five years ago, recognizing the unique window into cultural history that they provide, Ms. White began a collection that now contains nearly 1,600 volumes. Recently retired after nearly 40 years as a librarian for the Houston Academy of Medicine–Texas Medical Center Library, White understands the value of her Texas cookbook collection as a historical resource and has pledged to donate her materials to The Texas Collection, significantly enriching our already wide assortment of resources in this area. 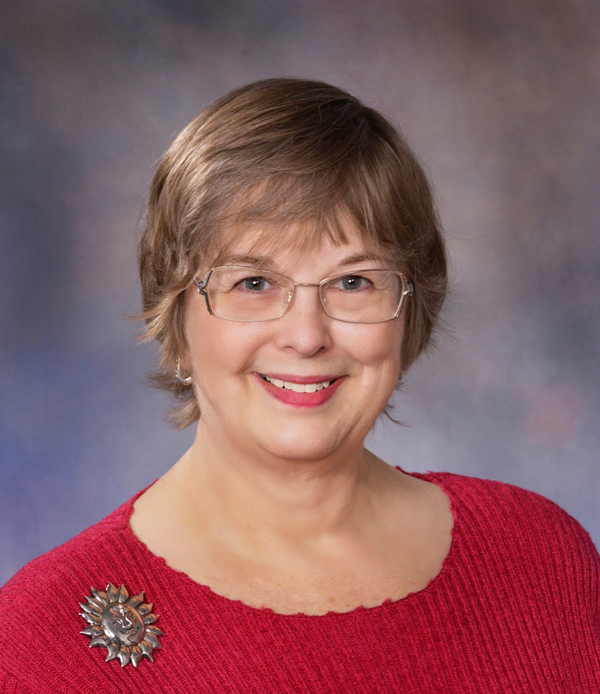 In addition, Elizabeth White has generously established the Biscuits and Gravy Endowed Fund–a permanent endowment that provides funding for future purchases and preservation of the cookbook collection. “Treasure Pots,” The Austin Woman’s Club, 1940 which includes recipes for Salmagundi Dressing, Admiration Pie, and ‘Possum and Sweet Taters. What’s Cooking in Our Swedish-American Kitchens, Central Methodist Church, Austin, c.1951, with Wienerbrod (Coffee Bread), Kroppkakor (Potato Dumplings with Pork), and Brysseikax (Iced Box Cookies). Also Tuna Noodles and Tamale Pie. Portrait of A. Fillmore, author of one of the first cook books by an African-American chef, The Lone Star Cook Book and Meat Special (From the Slaughter Pen to the Dining Room Table), Hotel Lubbock, 1929. Advertisement for Kitchen Queen’s Baking Powder (“Healthful and efficient.”) and J.E. 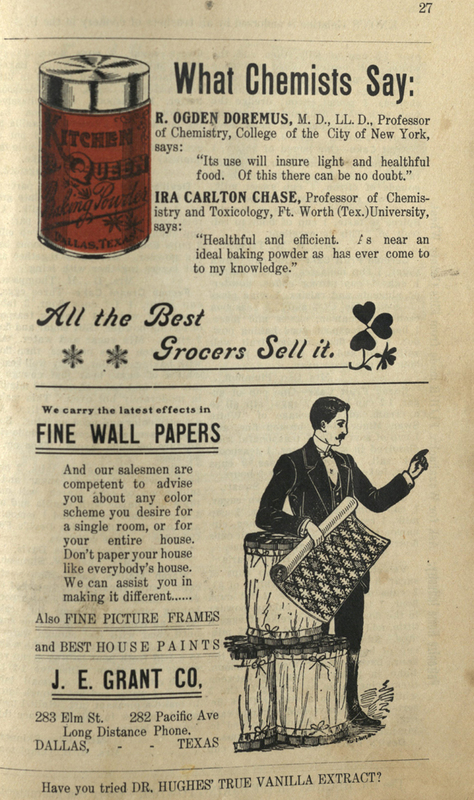 Grant Fine Wall Papers (“Don’t paper your house like everybody’s house.”) from the Waxahachie Cook Book, 1902 . 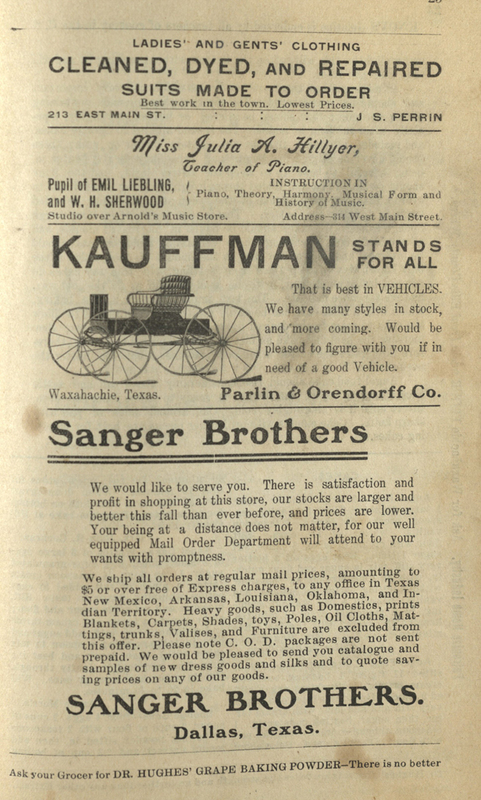 Advertisements for Miss Julia A. Hillyer, Teacher of Piano, and Kauffman Vehicles (“Would be pleased to figure with you if in need of a good Vehicle.”) also from the Waxahachie Cook Book, 1902. 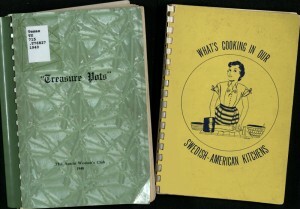 The Texas Culinary Collection is a fascinating look into the kitchens of the past. These cookbooks help us understand the history of the organizations that authored them, and the daily lives of the chefs and homemakers whose recipes they contain. They remind us of businesses and products no longer available, and of trendy foods no longer in fashion. Come in and sample the collection for some great reading and great cooking!